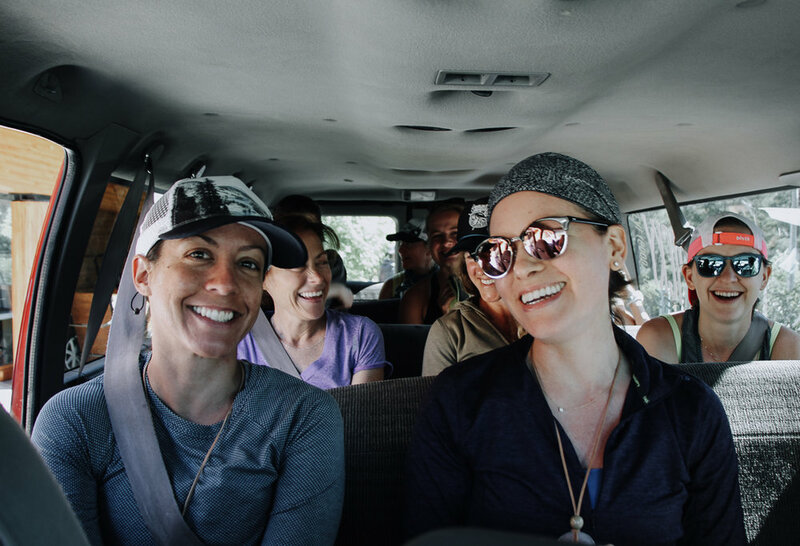 This Wilder Running and Writing Retreat for Women utilizes running, writing, storytelling, yoga, coaching, and the beauty of the outdoors to inspire creative and physical courage. We aim to stretch ourselves with the help of teachers, learn from the work of other women, and fill ourselves up with fresh air, big trees, dramatic landscapes, rushing water, good food, laughter, and a mixture of community and solitude. A wilder approach to running and writing will help fuel confidence and purpose in the work we do at home for ourselves and our community. Get a feel for the retreat below, and for more photos check our Facebook page. This will be our fourth retreat held at this incredible location. Caldera Arts Center is located 3,500 feet above sea level on the shores of Blue Lake in the Cascade Mountain Range, just west of Sisters, Oregon. The 116 acres are immersed in beauty, surrounded by the effects of volcanism and the Deschutes National Forest, and is a renowned space for creative work in the Pacific Northwest. Features include a Hearth Building for group activities, a library, comfortable writing space, indoor and outdoor spaces for group and individual activities and relaxation, a private dock, a variety of lodging options, and access to beautiful running trails. The retreat will officially begin Friday late-afternoon, June 21st. Saturday and Sunday will be very full days from sunup to sundown. The retreat will conclude with a half day on Monday, June 24th. The detailed schedule will be released to accepted applicants in plenty of time to plan travel. This is a women's retreat for runners who write and writers who run, capped at around 30-40 participants. We use an inclusive definition of “woman” and “female” and we welcome trans women, genderqueer women, and non-binary people who are significantly female-identified. you believe you never “grow up” but are always “growing up"
Price varies based on lodging options (included in cost). *There will be two scholarships available to cover a significant portion of lodging and retreat costs. Preference will be given to recent graduates and people working in social justice. The scholarship application is included within the retreat application below. Please do not apply for a scholarship unless you would not be able to attend without it, otherwise those who do need it are likely to get overlooked in the applicant pool. We will use running in different ways, for different purposes. All paces and experience levels will be respected and encouraged. We'll experience beautiful, scenic trail runs in the wilderness, with footing ranging from smooth to moderately technical. One day will include a more formally coached workout by Lauren Fleshman, with instruction on technique, mental strength, and core strength. Over the course of the weekend, each guest will also have an opportunity for one-on-one advice if desired. We will explore writing in many forms. There will be full group sessions, smaller breakout groups, independent writing and reading time, and the opportunity for individual guidance with Marianne Elliott on the work you're doing at the retreat. The emphasis will be on writing for potency, and removing the barriers that get in the way of our most powerful work. 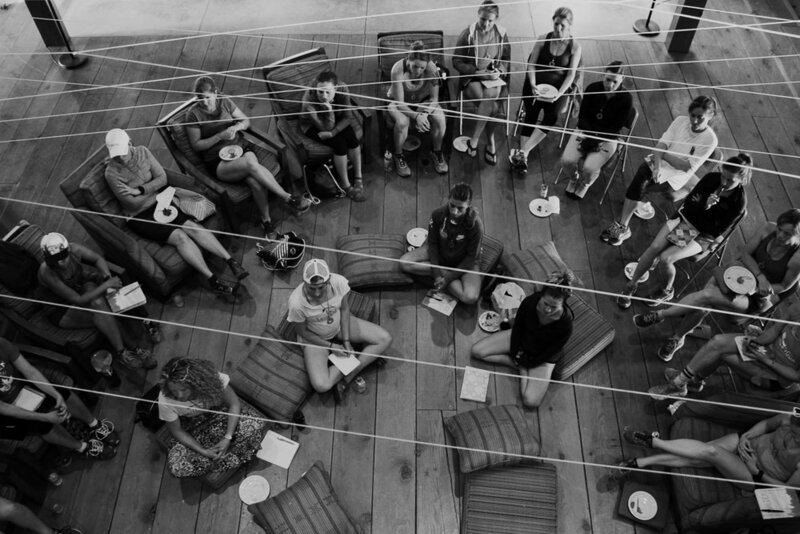 Caldera is a private venue that does not generally offer lodging to the public outside of their artist residency program, camps and specific events that share their creative mission. The spaces are designed to be minimalistic, rustic, and clean, in synergy with the natural surroundings and suited to an artistic lifestyle. Wilder will have exclusive use of the property for the retreat, with two different lodging options for participants. Accepted applicants will get to choose between A Frame loft Cabins (shared), and Tamarack Hall (private queen rooms with shared bathrooms) upon signing up, on a first come first serve basis, while space lasts. 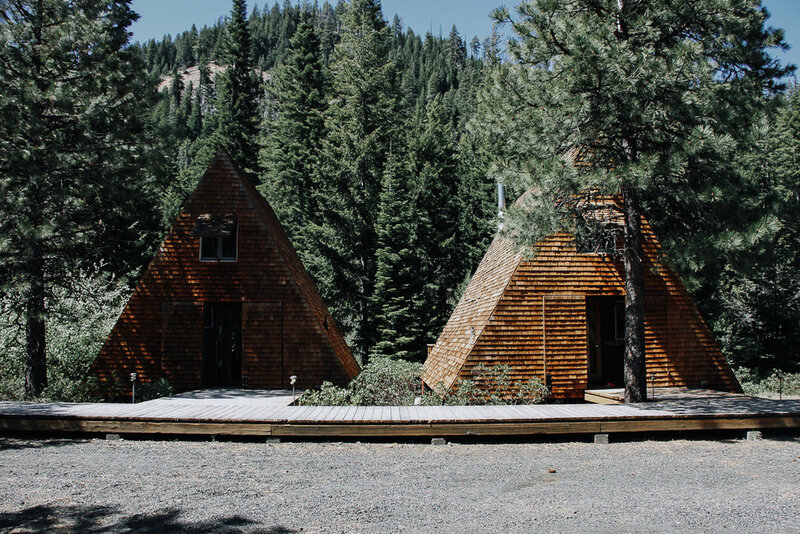 These airy A-frame cabins are simple, clean, and perfectly suited to a communal Wilder retreat experience. Each one features a sleeping loft, livingroom/work area, kitchenette, bathroom with shower, wood stove, and a porch overlooking the creek. Standard cabin design includes two beds downstairs in the space that serves as a shared living space during the day, and two beds in the loft. Capacity is 1-4 guests per cabin. Designed to be a space for artists to have both private and communal space, Tamarack Hall features hotel-like accommodations with shared but private bathrooms, and shared kitchenette, laundry facilities, and a central meeting room with a large fireplace. There are 22 private bedrooms, each with one queen-sized bed. *We will be able to accommodate vegans and provide gluten and dairy free options. Those with severe food restrictions may need to make their own meal arrangements. Let us know and we'll do what we can to help you find what you need. *We will also have a variety of snacks available throughout the retreat, and guests are welcome to bring whatever special food items they would like onsite. Yoga, mindfulness practice, and meditation will be available throughout camp to enhance the experience, led by Julia Hanlon. There will be whole group sessions, optional sessions, and opportunities for individual guidance on how to enhance your home practice. Transportation to all off-site running adventures will be provided to and from the retreat site. Participants will need to make their own arrangements for transportation to and from airports to Caldera on Friday and Monday. Accepted applicants will have an opportunity to arrange shared transportation with other participants if they’d like, in advance of the retreat. The backyard of the retreat site is Blue Lake, and there will be stand up paddle boards and other toys to enjoy, as well as places to sit back and watch people and wildlife enjoy the water. The trails through burn forest and volcanic cinder are beautiful for hiking or finding a quiet space to relax. Some special items will be assembled for everyone to enjoy during and after the retreat. The retreat does not include travel to and from Caldera Arts from the airport on Friday and Monday. The Wilder Women's retreat in June is limited in size to 30-40 people. Up to 30% of spots will be selected by the retreat teachers from applicants in their personal communities who they feel will be additive to the overall experience, and 70% of spots will be reserved for the public. We are looking forward to reviewing your application! Consider applying for our upcoming fall retreat, location and date released soon.